Touch the Keyboard Settings key to summon the Samsung Keypad Settings screen. The Keyboard Settings key looks like a gear and is just to the left of the Space key. Ensure that a check mark appears by the option XT9. To place a check mark by that option, touch the gray check mark box. Ensure that a check mark appears by the option Automatic Full Stop. Setting this option directs the Galaxy Tab to add a period anytime you press the Space key twice. Ensure that a check mark appears by the option Auto-Capitalization. When this option is set, the Tab automatically capitalizes any character you type after typing a period and a space. Touch the Back icon button to return to whatever you were doing earlier. When the XT9 option is on, you see a list of text suggestions appear as you use the onscreen keyboard. 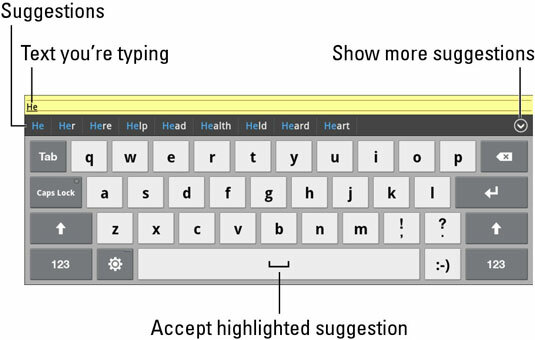 Choose a word from the list by touching it with your finger, or choose the first (fully highlighted) word by touching the Space key. To undo an automatic word selection, press the Delete key on the keyboard. If you find the XT9 setting annoying (and many do), repeat the steps to disable it.